The key combo in the deck is Coercion + Final Flourish. By using the two together you can use an opposing fatty, and then kill it to do damage to another opposing ally. The combo makes me cringe as such a waste of cards and resources, but it actually sort of works in this deck. First of all, it can potentially trade 2 cards for 3. 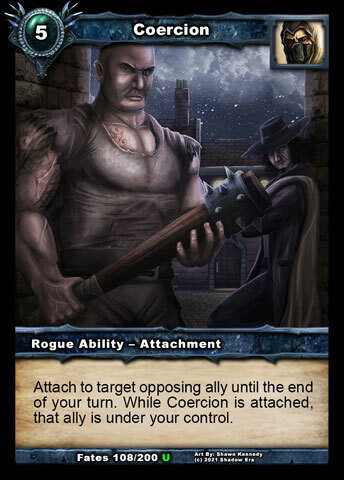 By taking an opposing fatty, using it to kill an opposing ally and then using final flourish to kill a weenie, you can gain a card advantage. 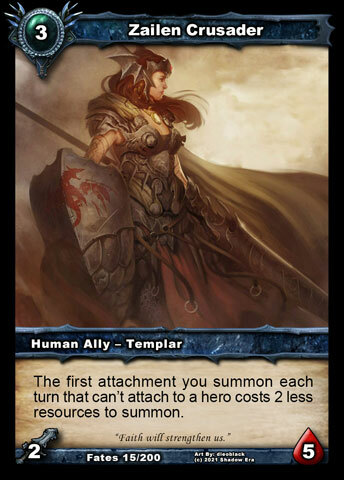 The key to making this combo worthwhile and consistent is other cards in deck that support the combo. For example, Zailen Crusader makes Coercion cheaper, while Confluence of fate offsets the wasteful use of cards by giving you draw for playing coercion. There are other useful synergies in this deck based on the advantages granted by Zailen Crusader and Confluence of Fate. 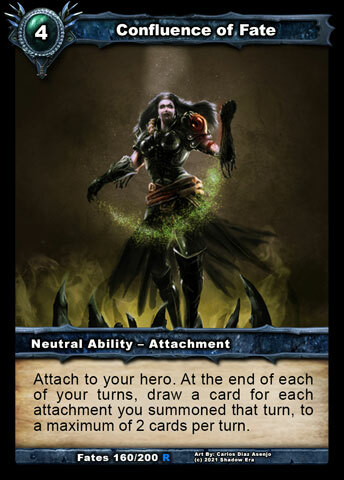 Essentially any of the attachments double as a draw engine, and with Zailen in play can be free. Backstab, for example is already a great and efficient card, but with both of those cards in play it gives you two cards and costs nothing. The drawback of using confluence of fate is health loss, which is partially offset by Crimson Vest and strong offensive combos (such as Irina + Backstab). I personally was hesitant to play this deck, but played against Maxi1230 while he was using it, and he really gave me a run for my money. I eked out a win in the end, but it was close and he really convinced me that this is more than just a trick deck. I’ve also watched several of his games with it, and the deck seems to work consistently. I’ve tried it myself a few times, and while the style is weird for me, it’s certainly not weak. So if you want something different and fun, I recommend you give this a try. A few notes – since this is an attachment oriented deck, other attachments may be useful as well. 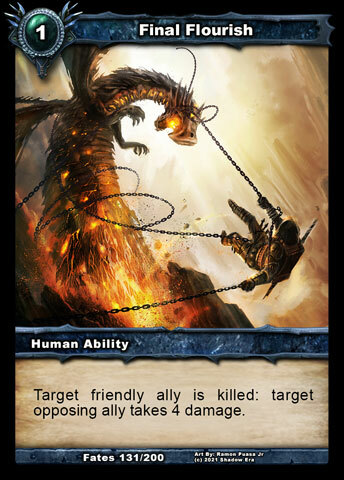 For example, A Legend Rises can offset the risk of unique allies being disabled by attachments, while also providing some draw through Confluence. Similarly changing the number of treasured heirlooms can provide some extra draw if needed. Tagged attachment, Backstab, lance, Shadow era, shattered fates. A little update – I decided to actually give this deck a spin and had a few interesting games. In one I got what seemed like a horrible draw – 4 Coercions in my opening hand. I wound up having to resource one of them. Somehow I still managed to get in the game and get my draw engine going vs. Gravebone. I even began to dominate the board. He then played Ogloth and supernova, pumping Ogloth to 6 attack. I then proceeded to use Coercion every turn to death race him with his own Ogloth. It was really amazing.